These are a real treat for the whole family – chocolately, moreish yumminess that are so simple and great fun to make. Preheat your oven to 180°C (regular)/165°C (fan), gas mark 4. Prepare 8 inch/20 cm square tin (at least 2 inch/5 cm in height) by greasing inside all over and lining the bottom of the tin with baking parchment. Place a large bowl over a pan of simmering water ensuring the water does not touch the bottom of the bowl. 2 inch/5 cm of water in the bottom of the pot will be enough. Melt the butter and chocolate in the bowl, stirring gently until fully melted. Using a wooden or metal spoon stir in the sugar, vanilla and the cocoa powder stir until well combined. Add the eggs one at a time, stirring between each addition. Finally add the flour, salt and the optional choc chips or nuts (if using) and mix until you have just combined all the flour into the batter. Pour the runny batter into the prepared baking tin and use a knife or spatula to spread it evenly around the tin and into the corners. Place the tin into the centre shelf of the pre-heated oven for at least 30minutes before you check to see if the brownies are done. Unlike a standard cake, brownies should be gooey in the centre so using a skewer to check if it’s cooked will not work. You should check to see that there is a cracked crust on the top. Also, use a knife and cut a line through the centre of the cake, push aside slightly and check to see if the batter is still runny. 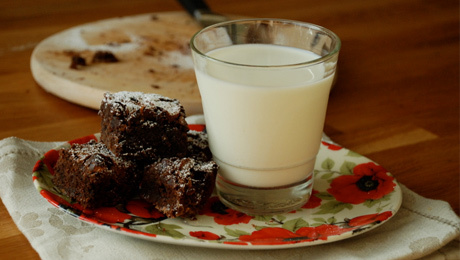 If the batter is runny return the brownies to the oven and check again after a further 10 minutes. Once the brownies hold their shape you can remove from the oven, but they should still be sticky. Once you have removed the cooked brownies from the oven, cut them in the tin to the required size and then allow to cool a little in the tin. Use a knife, angled spatula or fish slice to remove from the tin. Extremely easy to make. The smell from the kitchen when they are baking is so delicious, you are only short of watching the oven to hurry them along. 45 minutes is way to long: less than 30 minutes - 25 max is plenty. Any longer and they won't ALL be gooey - just the middle section. As with baking anything for the first time, you learn from your mistakes and bake a better batch the next time. I've made these twice now, they are delicious. The recipe is fool proof. They take 22 minutes in my oven, any longer and they would be overdone. I'd recommend using good quality chocolate. Excellent recipe very quick and gooey, try adding some white chocolate or raspberries. Great recipe - just made these and worked perfectly. Made these at the weekend and they turned out great. really gooey and tasted fab.